Remember the time when DLSU was neither a member of two of the country’s premiere collegiate leagues, the UAAP and the NCAA? Most, if not all of those currently in campus may not remember that. Save for one – the Green Archer statue. Currently located at the Central Plaza looking far and wide, Archie, his preferred name, has been a witness to the changes within and beyond the hallowed halls of DLSU. Throughout 30 years of existence, he has followed the success, as well as the failures, of the different Taft-based squads. “I’ve been here for like, what, 30 years? During that period I saw many things I wouldn’t talk about much for the sake of brevity and perhaps ‘confidentiality’ but I saw a lot of things,” he comments. 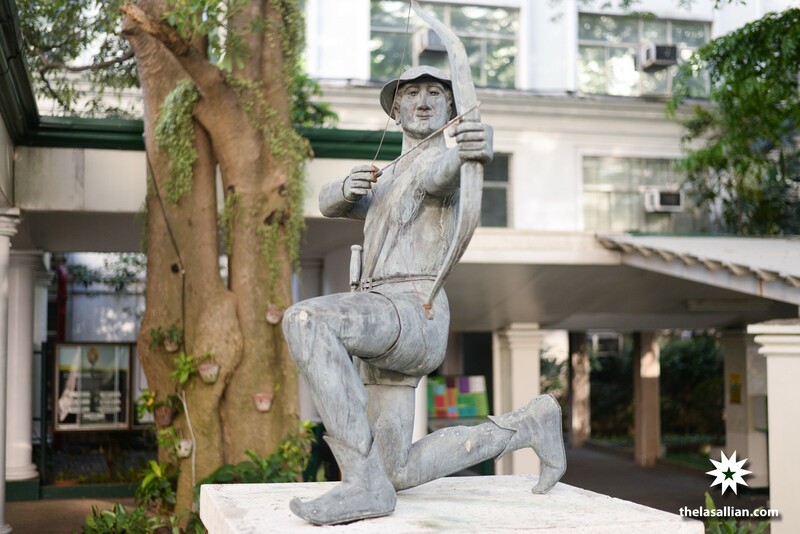 Renowned Filipino artist Ed Castrillo, who also created the People Power Monument along EDSA among many others, gave life to the Green Archer statue that was commissioned by the Class of 1966 under the leadership of Muniosguren in 1985. In 1986, it was first exhibited during the celebration of DLSU’s Diamond Jubilee and was then transferred to its current location in 1992. During the construction of the Henry Sy Sr. Hall however it was once again moved until 2013, when the Green Archer Statue was returned to its current position. “[In] my first five years here I saw La Salle win championships, especially in Men’s Basketball, when they won the back to back titles in 1989 and 1990. There was also the Men’s Tennis at the start of the 90s; and Swimming: one in 1988 [Men’s] and two in 1990, I guess, both in Men’s and Women’s,” shares the Green Archer. Along with the sweet successes come bitter shortcomings as DLSU failed to capture the prestigious UAAP General Championship (GC) crown for almost three decades. Only in the 75th Season of the UAAP did La Salle capture that elusive title, and Archie was there to celebrate it. “[UAAP] Season 75 was a blast! DLSU teams in general fared well against their competitors and finally, after so long, we were able to bag the GC. I was so elated during that time, I know it doesn’t show but I really and undoubtedly was,” he exclaims. As season 77 comes to a close, which is sadly a season marred with the loss of the general championship and the numerous unfortunate injuries to DLSU’s athletes, the Green Archer statue remains as hopeful and proud as he’s ever been even with around five months left before the start of UAAP season 78. “Today we may have lost the battle, but the war is far from over. Time will come when we’ll be looked up to again as the sporting elite,” he mentions. “For now, I can only wait. But waiting is fine. If you must know, I’ve been shooting eagles hovering around town. You haven’t seen any, right? You’re welcome,” Archie concludes.